A fashionable pastime for affluent Victorians was to form collections, and a popular theme was butterflies, as these could be displayed in cabinets in the home and exotic specimens could be brought back from travels abroad. W. F. Kirby has been called the 'Father of Entomology', he studied insects for almost 58 years and published many important works. He was an assistant in the Zoological Department at the British Museum. 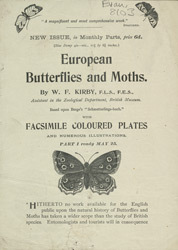 'European moths and butterflies' was a significant book as it covered insects in the whole of Europe rather than a single country such as England or Germany. The book is illustrated by 62 colour illustrations, which would have been helpful when identifying specimens.